The Youth on Course Hundred Hole Hike is a physically and mentally challenging event where golfers walk and play 100 holes of golf in one day. This year, 60 golfers completed the event and raised more than $295,000 to help provide youth with access to affordable golf. Learn more about how Youth on Course continues to grow this fundraising event. Retaining new participants to a fundraising event is difficult. Most nonprofits lose participants because they fail to connect with the participant, the event doesn't fit their schedule, or the participant decides to support a different cause. Retention is so important to a fundraising event because returning participants raise 2.5 times more than a new participant. In addition, recruiting new participants requires even more energy than retaining existing participants. Typically, if you have a retention problem it is because you have a recruiting problem. Recruiting and retaining participants to a fundraising event requires stewardship. Through a retention and recruitment strategy, Youth on Course was able to implement their largest fundraising event ever, growing participants by 140% and funds raised by 225% in 2018. In 2016, Youth on Course wanted to test a fundraising event called the Hundred Hole Hike on Pledge It. The Hundred Hole Hike is an event where participants attempt to walk and play 100 holes of golf in one day. Supporters can make a pledge per hole or a flat donation. Youth on Course was able to recruit 6 participants in 2016. The event raised more than $25,000. In 2017, Youth on Course spent more time developing relationships with the original 6 participants. Through these efforts, the original 6 participants joined again and helped recruit 19 new participants. The retention and recruitment strategy resulted in 25 participants who helped raise more than $90,000 in one day. This year, Youth on Course focused more time on recruiting new participants. Specifically, their team leveraged existing relationships with state and regional golf associations to recruit new participants. These partners helped Youth on Course recruit 24 new participants. In total, Youth on Course was able to recruit 60 participants to join its event in 2018. The event shattered expectations, raising more than $295,000! Golf teaches important social, mental, and physical skills and each round is filled with learning potential. Providing youth with access to affordable golf is the core of Youth on Course's mission. Youth on Course members play golf at more than 900 participating courses for $5 or less. 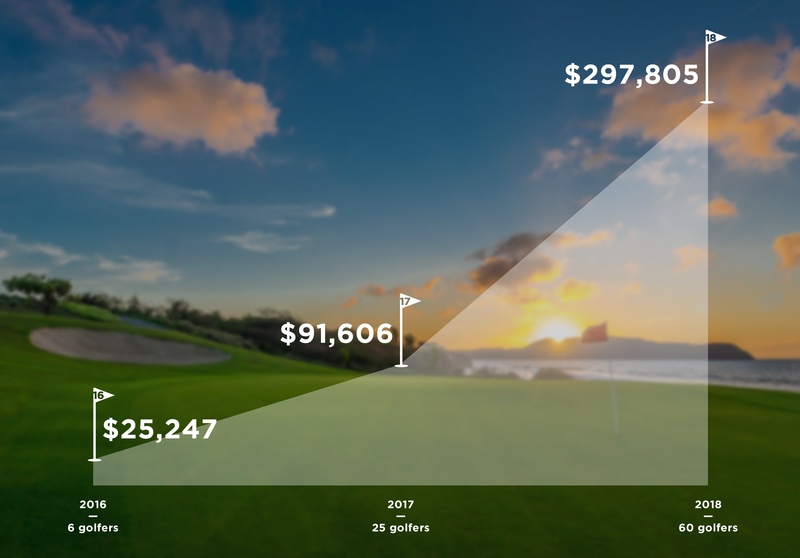 To date, Youth on Course has expanded to 26 regions, subsidized more than 650,000 rounds of golf, hired more than 115 interns and 362 caddies, and awards more than $250,000 in scholarships annually.